Monroe, like many cities across the United States, memorializes its veterans with a very nice shrine and annual recognition of those who serve to defend and protect. The Monroe Veterans Memorial in Monroe, Ohio is located at Main Street and State Route 63. This video was shot on location in September 2011. Shown in the video are the memorial mural, flags, and all United States Military seals. This video also includes bricks memorializing all the men and women who have been or currently are in uniform and who also live in, have lived in or are somehow connected with Monroe, Ohio. Background music is by Dr. Mark Wolbers who conducts the University of Alaska, Anchorage Wind Ensemble in this recording of the "American Salute for Band" By Morton Gould, arranged by Douglas E. Wagner. This recording took place in the Discovery Theater at the Anchorage Center for the Performing Arts in 2001. If you go full screen, you can read the names on the bricks and the wall. Below is a slide show from the Inauguration of the Monroe, Veterans Memorial on May 22, 2009. Present are all Monroe Veterans Memorial Committee Members as well as hundreds from the community. Many in attendance have their names on the bricks in the video above. The memorial was dedicated in May of 2009. The committee members are: Mike Barnet, Robert Bretland, Jeff Caron, Clarence Cox, Peter Dame, Darsie Flannery, Robert Hale, William Hendrickson, Ed MacDonald, Harold McFeeters, Jack McGuier, Rodney McGuire, Fred Myer, Boyd Smith, Bill Brock, Virgil Maines, Brad Collins, Elbert Tannreuther. Monroe also celebrated at the memorial in both 2010 and 2011, see video below for 2010. 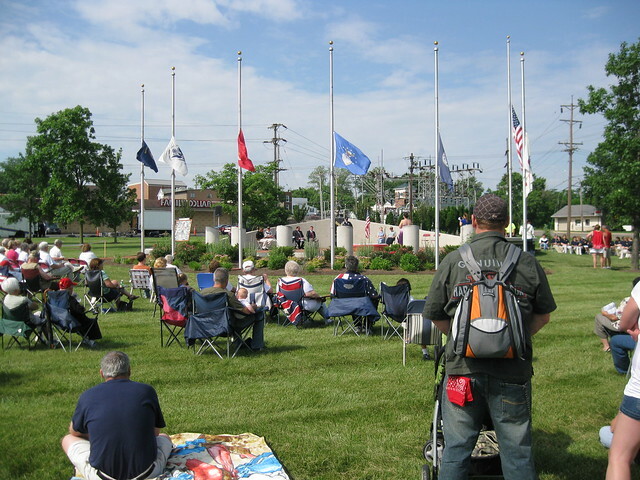 In 2011, Monroe celebrated its veterans on May 30th at 10:00am at the Veteran's Memorial. Participants for the event include Guest Speaker, Fred Meier, the Monroe Marching Band, Soloist, Monroe High School Student Saxon Hall and the Cincinnati Boys Choir. I am sure that most of you have observed the progress that has been made on the Monroe Veterans Memorial located in the park at the intersection of North Main St. and Rt. 63. Most of the work completed to date has been donated by Baker Concrete and Ball Bros. Construction Co. We are so thankful to have local businesses who are interested in our community to donate their time and services to help bring this project to completion. The remaining work will be going up for bid very shortly. The Memorial Committee is hopeful that the construction work will be complete by Veterans Day, so that we can have our dedication on or near November 11. A number if people in our community will be participating, including the Elementary School students, High School Band and the Beacon Quartet. Please keep that date in mind and we will keep you informed as to the exact date for this event. Pavers are still available, so any Veteran or Non Veteran wishing to purchase a paver can do so by using the application. Please follow the instructions as printed on the application. We thank you very much for your support.